What do Scouts do?? More to the question of What do Scouts NOT Do? Scouting put the OUT in Outing. We camp, hike, bike we learn the skill of archery and bb shooting and play lots of sports. We assist in our community while learning. A true hands on year round program. We encourage the boys and girls of our pack to be involved in sports and within there church and school. What this means for you is that we are a year round program so we are always here. There is a belt loop for everything you can imagine even video games. WOW !! JOIN US at our next Pack Meeting or call me I will get you all the details and look around our site and see when your den might meet. Call or text me at 580/512-5192 or email cubpack185@hotmail.com Or to Face Book Page at Cub Scout Pack 185. 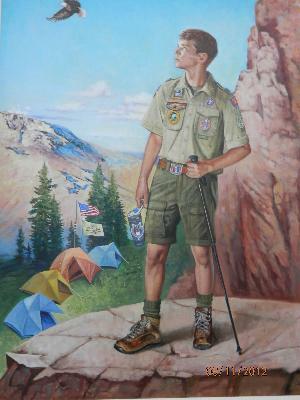 This is the National Boy Scout of America painting that was unveiled at the Eagle Scout Ceremony in August 2012 at the National Scouting Museum in Fort Worth, Texas. This painting shows and tells so many stories of what scouting is about. May your scouting experience be a great one!